Arivaca Lake, nestled in a hollow surrounded by some of the most beautiful high desert in the state, is rarely crowded. At an elevation of 3,750 feet, the shores of Arivaca are solid with big trees and shrubs that insects love, so if you go there in the summer, you had better remember your bug repellant and sunscreen. Arivaca averages about 80 acres in size. The lake is usually very low in the summer, and even the rains during July of this year did almost nothing to improve the situation. Launching a small boat (think car-topper) is still possible, but you need a four wheel drive to get to shore, so a boat that can be dragged or carried to the water is your best bet. Boat motors are limited to a single electric motor only, but that�s ample for this small lake. Also, make sure you park your vehicle up in the designated parking lot or you risk a ticket. The weeds at Arivaca are thick and getting thicker, which can make fishing from shore difficult. For bass, try fishing a floating worm rigged weedless, or pull a topwater rat or frog over the weeds. 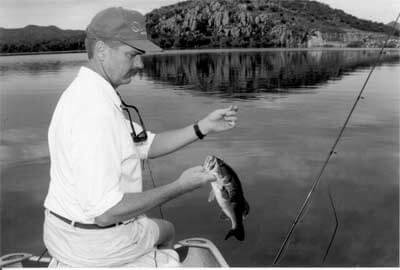 Bass fishing is usually pretty good at Arivaca, but you must let them go immediately. If you have launched a boat and are using an electric motor, you might want to invest in a Shear Magic by Mister Twister. This is a blade that attaches to your trolling motor to keep the weeds from getting it stuck. Right now at http://www.mepps.com/mistertwister/ they have them on sale for less than thirty dollars. There are no developed camping sites at Arivaca, no water, and no facilities except for toilets. You want to make sure you have everything you need with you when you get there, unless you want to drive the seven miles of dirt road back to the town of Arivaca. There are plenty of open spots around the lake that you can camp on, and all but the biggest RVs should be able to navigate the roads in successfully. With a really big rig, I would call the Coronado National Forest at (520)-281-2296 and inquire about road conditions. Because of high mercury levels in the warm-water fishes (bass, sunfish, and catfish), the Game and Fish Department recommends that you not eat these species. This means that Arivaca is basically a catch-and-release lake, and because of this, there are some huge bass and catfish in the lake. The lake is only about 28 feet deep at the deepest point, so the action is good all year long. In the summer and fall, topwater lures are among the most popular baits for bass. When the weeds are up, huge bass will lurk in water so shallow that you can see their fins sticking out of the water. Throw a plastic rat right up on shore then twitch it slowly across the weeds with short, uneven jerks. When the moss behind the lure starts to bulge, hang on! Spook-type lures and chuggers work well in warm water too, if you can find some weed-free areas to work them. Snag Proof makes a bunch of weedless lures that Arivaca anglers swear by. If you try something with dangling treble hooks, you�ll spend most of your time cursing and picking weeds out of the hooks. When the weeds are lower and there is some open water, crankbaits and spinnerbaits work very well. Pitching a spinnerbait or a jig up under an overhanging tree is almost a sure-fire way to get a nice bass to bite. We saw a couple of mosquito fish floating on the water, and they look a lot like shad, so a crankbait in a shad pattern would be my choice. In winter, jigs and Texas-rigged worms on points and underwater structure are good producers. There are a lot of good, healthy sunfish at Arivaca. Tiny jigs or mealworms fished under a bobber were taking sunfish all along the shoreline when we were there in August. Arivaca has also produced enormous catfish, and the frog population is unbelievable. The shoreline at Arivaca varies from weedy mud banks to rip-rap or bluffs. You can walk pretty much all around the lake on the well-used paths that circle it, but again I warn you to make sure you wear insect repellant; the mosquitoes and no-see-ums will eat you alive if you don�t. With the lake so low, the paths may be quite a way from the water, so be careful getting close. The mud can be sticky. To get to the lake, take I-19 south and go west at the Arivaca turn-off. You�ll pass through the town of Arivaca, then just follow the signs. The last few miles are dirt road. If it has been rainy, take care. There are several washes that cross the road, and they can get nasty if they have been running. Keep an eye out and you might see white tails, mule deer, javelina, and other wildlife. Arivaca is also right in the middle of some of the best birding country in Arizona, so bring your binoculars if you are a bird fancier. For current information on fishing at Arivaca, contact the Tucson office of the Arizona Game and Fish Department at (520) 628-5376. You can also check the weekly fishing report at www.azgfd.gov.